Laparoscopic sleeve gastrectomy has been confirmed to be a safe and effective primary weight loss procedure. Although other bariatric procedures have demonstrated improved glucose control and decreased medication requirements in diabetic patients, this has not yet been established for sleeve gastrectomy. We hypothesize diabetic patients undergoing a laparoscopic sleeve gastrectomy as part of a multidisciplinary weight loss program will not only lose weight but also require less medication to achieve improved glucose control. Diabetic patients undergoing laparoscopic sleeve gastrectomy at our center between September 2007 and September 2009 were followed prospectively. All sleeves were constructed using a 42 Fr bougie; staple buttress material was not used and staple lines were selectively oversewn. Pertinent bloodwork was obtained and medications reviewed pre-operatively and every three months post-operatively. Twenty-two diabetic patients including 20 females underwent laparoscopic sleeve gastrectomy; mean age was 46 years. The mean preoperative BMI was 51.6 kg/m2 (range 40.9 to 75.1). Mean operative time was 119.2 minutes (range 73 to 173); a single procedure was converted to open due to inability to reach the fascia with a 15 cm trocar. One patient returned to the OR for bleeding within a few hours of surgery, hemostasis was achieved laparoscopically. Weight loss outcomes are as demonstrated below, and are comparable to our non-diabetic patients. Preoperatively a single patient was managed with diet alone, 2 patients were managed with insulin, 13 were taking oral hypoglycemic agents, and 6 patients were taking both insulin and oral agents; all had abnormal fasting glucose and/or HbA1c levels. Postoperatively at an average length of follow-up of 4.2 months (range 1 to 18 months); 2 patients were off all medications, 8 patients had either decreased their medication dose or had discontinued one of multiple medications, and 11 patientsrequired the same dose of medication. The percentage of patients with normalized AC glucose and HbA1c is demonstrated below. 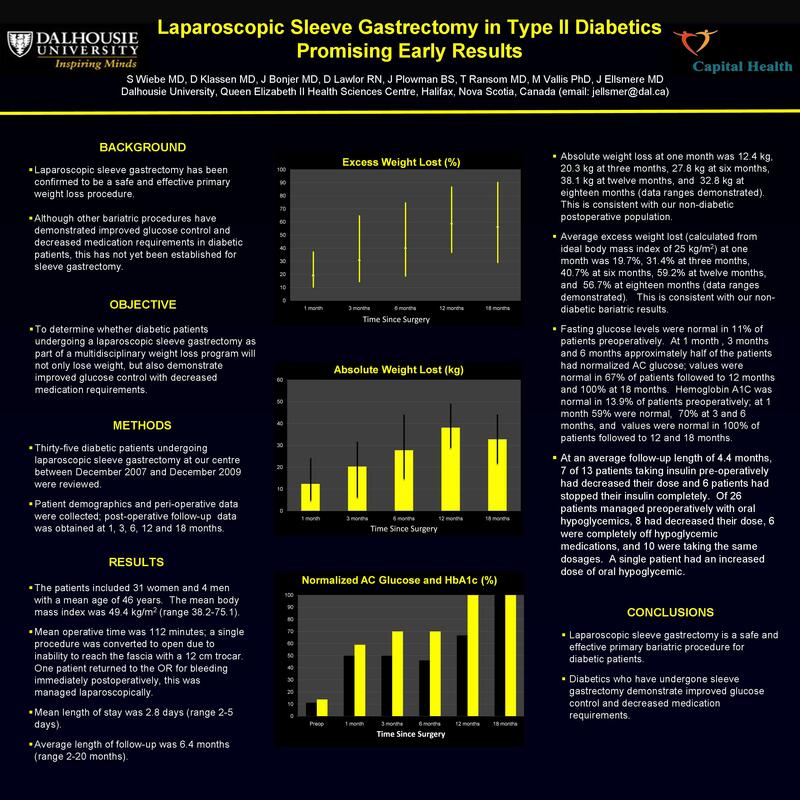 Laparoscopic sleeve gastrectomy in diabetic patients is not only a safe and effective primary weight loss procedure, but also leads to decreases in medication requirements and improved glucose control.